At Herbal Republic we take our environmental responsibilities very seriously. We have taken important steps to reduce our impact on the environment which is critical to the reduction of the greenhouse effect and acid precipitation. Whole leaf tea filters are unbleached, completely compostable and made with no staples or glue. 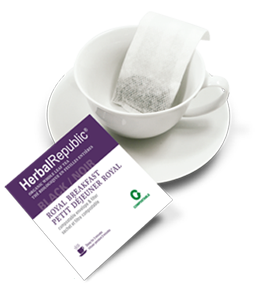 Herbal Republic has two exciting and innovative sustainable products for the Restaurants and Coffee Shops. The innovative Tea Bag filter is 100% certified compostable (including outer packaging). For further information please contact our Food Service Associate for setting up a customised tea program for your food service establishment. Herbal Republic is a supporting member of two important environmental programs. Firstly, the Green Table Network which is helping set the benchmark for sustainablily in restaurants across Canada. Additionally, the Ethical Tea Partnership which works to monitor living and working conditions on tea estates, with the aim of making sure that the tea you buy from the members of the Partnership has been produced in a socially responsible way.